Hopefully you guys enjoy this as much as I did, some really juicy information on upcoming things for Martyr. Massive thanks to Gergo and Viktor for their help and time. Strap yourselves in guys... That next milestone will be with us .... Ok - Just watch the video! All sounds prett damn sweet to me..... Roll on tomorrow! Cant wait to see the new Roadmap! @Neocore team: Could you guys post some Pictures of your booth from Gamescom here on the Forum for those who could not attend and would like to see how it was? Really awesome Hydra ! Just when I think I can't get anymore excited about this game...just wow ! Now, all loyal servants of the Emperor...Steel yourselves...the "Attack of the Steamtards" is near. 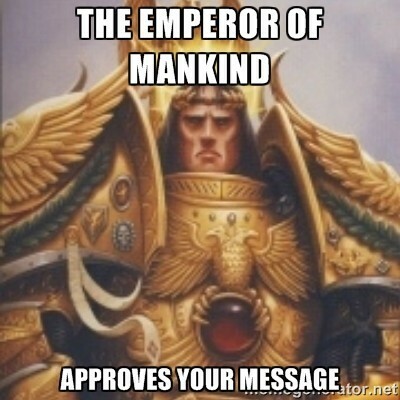 May the Emperor protect us ! Great video, and you actually touch on most of the questions I was putting together to post in the forums. Tomorrow many of our Prayers will be answered Brother. Going to be one busy weekend! Busy for you, perhaps. I'll be stuck waiting for the slow download to clear and if it's bigger than about 3 gigs, I won't see it until Monday. Local net is slow as-is, and it's atrocious right now with all the smoke in the air. >and it's atrocious right now with all the smoke in the air. If only. Wildfires have screwed up the air quality something fierce in the area, and it's causing problems with pretty much everything. I'd rather be purging heresy and smiting daemons. Today it would seem, although it was proposed in the interview as a probably. So no official offical confirmation on specifics.